This Set Includes - Four Comfo-Back Adirondack Chairs (With Optional Sunbrella Cushions and Throw Pillows) and One 38" Conversation Table. Grab your loved ones and your favorite beverage and gather around our beautiful poly conversation table. 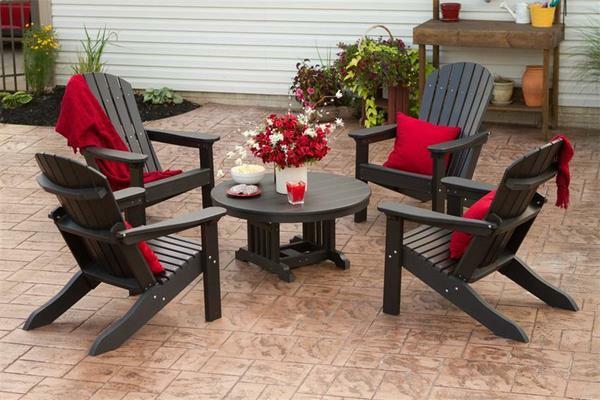 Surrounded by comfy Adirondack chairs, this set is sure to have you and your guests enjoying every outdoor occasion. Add our Sunbrella cushions and throw pillows and your guests my not ever want to get up again! Each piece of this set is handcrafted from eco-friendly poly, but skilled Amish woodworkers, resulting in a quality set that is built to withstand decades outdoors! Featuring a twenty year warranty for residential use, you can invest in your outdoor decor with confidence. Ground to Arm Height: 24"
Ground to Seat Height: 16"